1. In 4-1/2- to 6-quart slow cooker, stir broth, tomatoes, coriander, cumin, oregano and salt; add chicken, garlic, jalapeños and onion. Cover; cook on low 6 to 7 hours (high 3 to 4 hours). 2. Transfer chicken to cutting board; shred chicken with 2 forks. 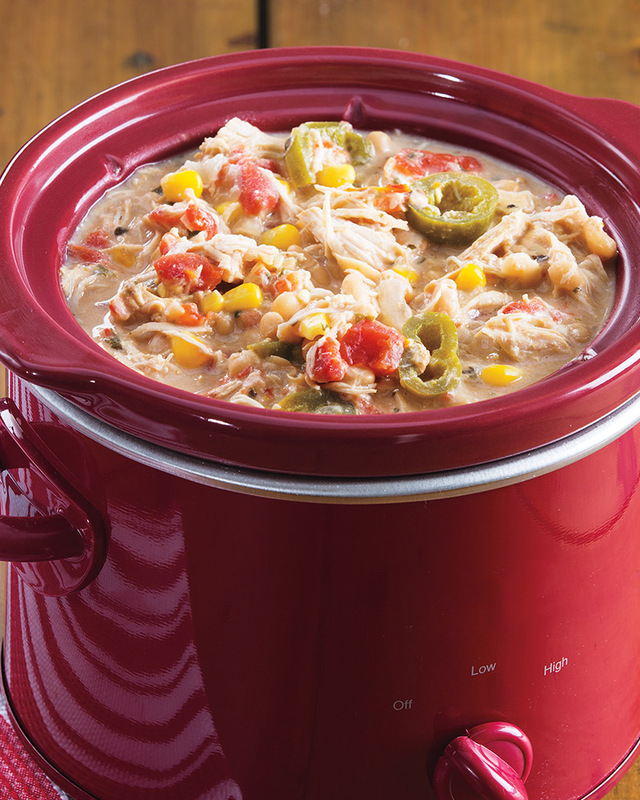 Stir cream cheese into chili, then stir in beans, corn and shredded chicken; cover and cook 15 minutes on low (10 minutes on high) or until heated through. 3. Stir in lime juice. Serve chili topped with Cheddar cheese and optional toppings, if desired. Makes about 12 cups. > If you prefer more of a traditional chili with ground meats, try using cooked Honeysuckle Ground Turkey in place of chicken breast. It will also be quicker if you don’t have all day to wait for the slow cooker.